Conservative Home recently published an instructive piece written by Isabel Oakeshott about the respective strengths of the two established “leave” campaigns vying for the award of lead designation from the Electoral Commission. 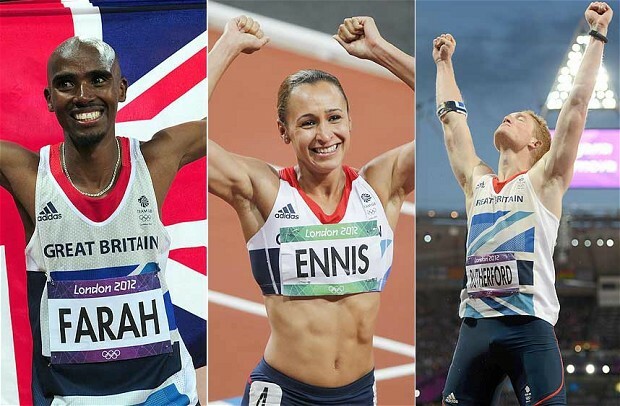 At stake is a £7 million prize and a once-in-a-lifetime chance to be the men who changed history. The fact that the money gets top billing says so much about the mindset within what Ms Oakeshott variously calls the “Westminister bubble” and “SW1”. This is the same myopia that led Vote Leave to launch with an introductory video that contains misleading figures about possible “cost savings” post-Brexit. The “remainers” are understandably making great play out of this schoolboy error—and who can blame them? It is not as if Vote Leave were not cautioned against taking this particular line. More than once. In her article, Ms Oakeshott essentially characterises Vote Leave as slick London professionals and Leave.EU as Arthur Daley upstarts, finally arriving at the fatuous conclusion that Nigel Farage—yes, that Nigel Farage—should play the role of king-maker bridging the gap between the groups. However, the Conservative Home piece is not without interesting information. Now, before venturing any further, let us just stop to take note of the fact that the operation Matthew Elliott heads is so “slick” and so “professional” that Vote Leave initially chose black as one of the theme colours (since changed) for what is even now a borderline unreadable website. The opening line on the page titled “The Campaign” reads: “Technological and economic forces are changing the world fast.” What pray tell is “the world fast” and why is it of such concern to Vote Leave? Bad jokes (yes, that’s what that was) aside, whoever did the copywriting for the Vote Leave website clearly did not take the work seriously. A brilliant networker and consummate professional, Elliott is part of the Westminster establishment and lives and breathes political campaigns. Some years ago, he came within a whisker of taking a job in Downing Street, so much so that he was given a guided tour of Number Ten and shown his future desk. At the eleventh hour, the appointment was purportedly vetoed by Nick Clegg (an excuse familiar to those who have read Call Me Dave) but David Cameron did later ask him to run the ‘No to AV’ campaign, and it was a triumph. In other words, according to Ms Oakeshott, Mr Elliott was “asked” by none other than the Prime Minister, David Cameron, to run the ‘No to AV’ campaign. Think about it. The Conservative Prime Minister who is now doing everything in his power to keep Britain in a “reformed EU” once selected Matthew Elliott to “do a job” for the Tory Party and Mr Elliott “came within a whisker of taking a job in Downing Street”. All very cosy. Moreover, as CEO of Business for Britain, Mr Elliott assiduously echoed the Tory Party line on “renegotiating” Britain’s EU membership in order that Britain may “remain” in a “reformed EU”. As recently as June 2015, in an interview with Ms Oakeshott no less, Mr Elliott was reported in the Evening Standard as saying, “If the Government gets a two-tier Europe, we’re very much in”, and, as far as I am aware, he has yet to publicly clarify whether, when or why his view changed. In light of Mr Cameron’s proposal for “a British model of membership” and Jean-Claude Junker’s statements about a “two-speed Europe”, it is important to clarify that Matthew Elliott and Vote Leave will campaign for a new relationship with our EU partners based upon intergovernmental co-operation not supranational subordination. Partners not servants. To the best of my knowledge, no legacy journalist has asked Mr Elliott the question. Then there is the attempt to re-write the history of the ‘No to AV’ campaign, which was a campaign that Mr Elliott ran so badly that he had to be rescued by the PM. Indeed, Mr Elliott said of the ‘No to AV’ campaign, “we’ve had the full public support and 100% help from [Conservative Campaign Headquarters] CCHQ”. Does Mr Elliott anticipate similar assistance during the EU referendum campaign? Given that Mr Cameron will be on the other side of the debate for once, the prospect seems unlikely. Perhaps unaffiliated Brexiteers might like to reflect on whether a man who is on the record as supporting the idea of a “two-tier Europe”, who had “100% help from CCHQ” during the ‘No to AV’ campaign and who is so closely affliated with the Tory Party that, but for the intervention of Nick Clegg, he may well have been given a job in Downing Street, is an appropriate individual to be leading the “leave” campaign in an EU referendum. Throw in “the brilliant former special adviser to Michael Gove”, Dominic Cummings, and apparently “it is easy to see why the commentariat (myself included) has rather taken it for granted that Elliott will run the Brexit campaign”. That would be the “brilliant” Mr Cummings whose idea of campaigning is to smuggle a pair of 19-year-olds into a CBI meeting in order that they may wave a sign and reluctantly chant—even the lads who were put up to the stunt seemed to have the good sense to realise that it was pretty embarrassing. As co-owners of Vote Leave Limited, Mr Elliott and Mr Cummings are also responsible for the biggest problem with the Vote Leave campaign: the absence of a credible Brexit plan. Without a clear destination and the assurance that its goals are both realistic and safe, referendum voters will not be inclined to place their trust in the “leave” proposition. Fortunately for Brexiteers, there is a credible Brexit plan and we do not need to rely upon the likes of Mr Elliott and Mr Cummings to make our voices heard. There is no getting around it, leaving the EU is complicated. Those who wish to deny the complexity involved in decoupling British institutions from 40 years of political and economic integration are either fools or knaves. Why then, one has to ask, are there so many Brexiteers—that is, those who are committed to leaving the EU—who insist upon raising what is already an extraordinarily high bar still higher? The most common culprits are what might politely be called “UKIP-types”, who insist that Britain’s high-levels of inward migration be addressed on day one, immediately post-Brexit. These people are falling foul of several fallacies: firstly, the majority of immigrants are not arriving as a result of any “freedom of movement” provisions seeing as they travel to Britain from non-EEA states; secondly, these “UKIP-types” are implicitly invoking what Dr Richard North has dubbed the “better deal” fallacy, which assumes that Britain would be able to negotiate equal Single Market access to existing EU Member States without accepting “freedom of movement” provisions. Whether this is desireable is less relevant than the fact that it is not achievable. The EU will not negotiate a “better deal” with Britain as part of the Article 50 Brexit agreement. The best that Britain can expect in terms of Single Market access is essentially (though not exactly) the “same deal” that currently pertains—and we should take it, not because it is ideal, but because the real prize is leaving the EU and putting the country back on the path to full global engagement and independent self-government. However, there is yet another fallacy from which Brexiteers should refrain and that is what I will call the “flying horse” fallacy. The fallacy is patterned after a characteristically apposite remark from The Boiling Frog, explaining why Brexit is necessarily a structured process: In a horse race, the jockies jump each fence one at a time. This is challenging. It requires training, discipline and skill. But, if the fences are stacked one on top of the other, the only way to make the jump is with a flying horse. By emphasising the idea that Brexit should immediately address issues such as immigration or energy or climate change policy, Brexiteers are in effect stacking the fences one on top of the other and in so doing creating the demand for a flying horse. I shall attempt to apply the discipline that I recommend here and—at least as part of this blog—refrain from expressing distinct views regarding these issues during the referendum debate. Britain’s EU membership is, at its heart, a constitutional issue that asks the fundamental question: Who governs Britain? Other issues, even those as important as immigration, are secondary. The British people cannot take control of the policy-making framework without first making it abundantly clear to the government, the politicians and the legacy media, along with their fellow countrymen and countrywomen, that supranational (“above the nation”) EU governance is fundamentally unacceptable for Britain—and always will be. Contrary to those who say that the “sunlit uplands” then await, a successful vote to leave the EU will be when the real work will begin. Post-Brexit we will need to rebuild the policy-making framework in order that governmental action in a wide range of policy areas presently designated “EU competencies” are brought under the control of the British people and become part of the “national conversation” once again. This, among other reasons, is why Brexit should be thought of not as an event but as a process—not Brexit but Flexcit—that can be taken one pragmatic step at a time. This is the second in a series of posts responding to the Prime Minister’s speech at the Royal Institute for International Affairs (Chatham House). The first was Cameron In Context. Fortunately for all of us, an entirely different set of circumstances to those that concerned Monnet and MacMillan now pertain and the reality of life in 21st century Britain is overwhelmingly better than I dare say either man could have envisaged from his mid-20th century perspective. As fellow blogger, White Wednesday, has described, globalisation is killing the EU, rendering its bureaucratic structures obsolete. Newspaper columnist and author, Tony Parsons, recently expressed a similar sentiment in a more popular form for GQ magazine. The intellectual basis for these arguments is expounded upon in-depth at EUReferendum.com—the search facility is your friend—and on Pete North’s Politics Blog and now on campaigning website Leave HQ. In brief, the aim of achieving “regulatory convergence” to facilitate cross-border trade within Europe, which accelerated with the creation of the Single Market, has gone global. This year, the World Trade Organisation (WTO) is celebrating 20 years of the WTO Agreement on Technical Barriers to Trade, which mandates that signatories apply international standards where one exists. The fact that both Britain and the EU are party to this agreement means that the entire argument about “Single Market access” and “no say” over Single Market rules is mute. Non-EU Member States that participate in the Single Market via the EEA agreement, like Iceland and Norway, and even countries way outside the EU, like Australia, which agree to maintain regulatory convergence with EU trading partners, backed by a formal Mutual Recognition Agreement (MRA) on conformity assessment, are not concerned about having “no say” over the “rules” because around 80 percent of the rules are made elsewhere, in global bodies, such as UNECE, Codex, the ILO, the IMO, etc., where those countries have independent representation. The single market has rules. We will not always get what we want from those rules. But we have more influence over them from inside the EU, where those rules are actually made. Apparently, the Prime Minister knows not of what he speaks. His argument is out of date. What he calls “the principle reason for our EU membership” is a compelling argument to “leave” the EU and forge a new relationship for Britain with the EU, founded on the principles of independent self-government and intergovernmental co-operation. The world has moved on from the quaint old EU. There is an emerging global single market and Britain needs to leave the EU to ensure that British ideas are represented in the global system and play a full role in shaping those processes. David Cameron recently made a speech propounding his desire for Britain to remain in a “reformed EU”. The problem for the Prime Minister is that the proposal is not his and the “vision” he outlines is of a third-rate country—relegated to the second-tier of a two-tier EU—without independent representation in many of the world’s important global forums. 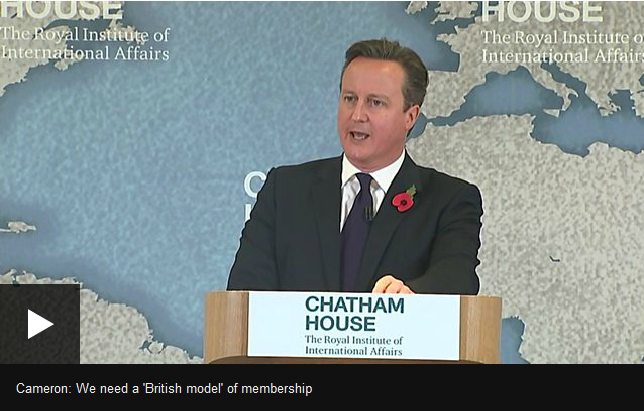 Wrapping “associate membership” in the Union Flag—Cameron’s British Model of membership—does not make the prospect of Britain resiling from the global stage any less noxious. Sadly, David Cameron is just one in a long line of British managed declinists. This particular breed of politician like the “crutch” that “Europe” offers and are content to watch as Britain’s global power is gradually usurped by the Brussels-based supranational treaty union. Beginning in 1961, when Harold MacMillan made Britain’s first representations to join the then European Economic Community (EEC), British politicians have lied to the British public about the true nature of this undoubtedly political project designed to bring the nations of Europe together under the control of a single supranational government. Indeed, the EU is almost universally misrepresented as an economic project, but while the elimination of tariffs and greater cross-border collaboration may have had a solvent affect upon the objective of “ever closer union”, the most significant part of the project is and always was the political objective of accreting ever greater control over ever more areas of policy (what the EU calls “competencies”) to EU institutions. In accordance with the wishes of the so-called “father” of the “European project”, French diplomat and congac salesman, Jean Monnet, Europe should cease to be a continent of independent self-governing nation-states and should instead become a group of Member States subservient to a supranational authority under bureaucratic control. The sovereign nations of the past can no longer solve the problems of the present: they cannot ensure their own progress or control their own future. And the Community itself is only a stage on the way to the organised world of tomorrow. This dismal vision was borne of the continental fear that, without such a system, democracy would lead, in all circumstances, inevitably to despotism and war. Britain, and England, in particular, with its long history of freedom under law and 300 years of largely peaceful constitutional evolution since the Cromwellian interregnum, never shared these early 20th century continental concerns and the British “establishment” instead embraced “le project” to asuage their fear that, shorn of the Empire, Britain would struggle to maintain economic productivity at the level to which the country had become accustomed. This context, ancient history to most who will be voting in Britain’s EU referendum in (probably) 2017, is important because it aids understanding of where we have come from and therefore, hopefully, where we are going. Monnet’s fears and MacMillan’s fears were real, but the fundamentally different approaches needed to solve these two national challenges—Monnet, a Frenchman, fearful of another war with Germany—and MacMillan, an Englishman, fearful of insufficient economic productivity, what some have termed “the British disease”—were never truly compatible, and it is only due to the deception of Edward Heath (a passionately committed europhile and “true believer” in the project) and successive generations of British politicians, that this uneasy relationship has persisted for so long. Now, with the need for greater political integration to resolve the problems that have arisen between incompatible economies in the eurozone (See: The Monnet Method), the British people find themselves at a “crossroads”. For perfectly reasonable historical, political, cultural and economic reasons, the British are disinclined to ever accept participation in the euro project or the borderless Schengen zone, so, unable to reach a satisfactory settlement, the politicians have absolved themselves of the decision. This referendum is a matter for the people. The choice that we face is, in short: either we accept the Prime Minister’s proposal for Britain to become an “associate member” of a “reformed EU”—outside of “ever closer union” and the euro but still accepting the subordination of our political and economic institutions and EU representation on the world stage—or we leave the EU and rejoin the rest of the world, asserting our commitment to independent self-government, national democracy and intergovernmental agreement as the proper means for ordering our affairs. NB: This is the first in a series of posts responding to the Prime Minister’s speech at the Royal Institute for International Affairs (Chatham House). The second is A Better Alternative. I doubt that I will find much support for this point of view amongst my blogging colleagues, but I am beginning to feel a grudging respect for David Cameron. The way in which he has so far outmanoeuvred the crass leave.EU and the boorish Vote Leave groupings demonstrates that he is a more capable politician than many had thought. Indeed, his “play” is a good enough case study that Dr Richard North has made it a feature of what EUReferendum.com is calling “Strategy Week”. As I mentioned in my previous post, the Prime Minister has been entirely consistent in telling us that he is working towards a “new relationship” for Britain with the European Union—and that is precisely what he is going to deliver. The broad overview for what that new relationship will comprise is sketched out in the Bertelsmann/Spinelli report, A Fundamental Law for the European Union, co-authored by Liberal Democrat former MEP and “EU federalist”, Andrew Duff, in which the more “flexible” settlement that Mr Cameron talked about today is referred to as “associate membership”. Contrary to the story that almost all of the legacy pundits are telling, there are major changes coming and there is going to be what politicians will refer to as a “reformed EU”. Contrary to the story that Mr Cameron is telling, however, these changes are not the result of his “renegotiation”. The “reform” that the British Prime Minister wishes to pass off as his own is borne of the need for the eurozone to integrate still further and much faster than even a europhile politician like Mr Cameron is willing to accept for Britain. Leave HQ reports in full. We need a British model of membership that works for Britain and for any other non-euro members. As befits a PR man, David Cameron’s plan to keep Britain in the EU is to rebrand “associate membership” as the “British model”, thereby implying that Britain will take a leading role in the second-tier of a two-tier treaty union in which the British political and judicial system remains subordinate to supranational EU institutions. Mr Cameron’s third-rate vision for Britain’s future will not appeal to anybody who understands that intergovernmental co-operation is a more flexible and secure means for projecting British influence than acceptance of the compromise position of the EU28 and representation by EU middle-men who speak on behalf of “Europe”. The question that referendum voters need to ask themselves and then discuss with their peers concerns whether Britain is better governed as an independent nation-state, in which the British people have the final say on policy, or as one of a group of EU Member States, in which national governments agree to accept the majority decision of the most powerful players and national electorates have no say in the matter. If Canada and Australia are capable of full self-representation at the global level, Britain can certainly do the same. Not to say that co-operation or trade with our European neighbours should be taken for granted. Far from it. The fact that EU membership is not suited to Britain is no reason for animosity or antagonism. The nations of Europe are amongst the most economically and culturally advanced on the planet and will remain so. However, our historical ties and future joint endeavours should not be defined by British participation in a political union that does not match our style of governance or our desire for global engagement. The Prime Minister has started to set out his stall, far earlier than some of us were expecting, and, perhaps owing to the paucity of opposition from the “high-noise” leavers, far sooner than he may have intended. The role of Brexiteers now is not to whinge about the EU or the paucity of Mr Cameron’s “demands”—he has outlined a credible scenario for Britain’s future inside the EU—what we must do is to present an appealing vision for what Britain’s future could be outside the EU, with an equally credible plan for achieving our vastly superior outcome. The political theatre continues, with the Vote Leave group playing its designated role without deviating one word from the expected script. 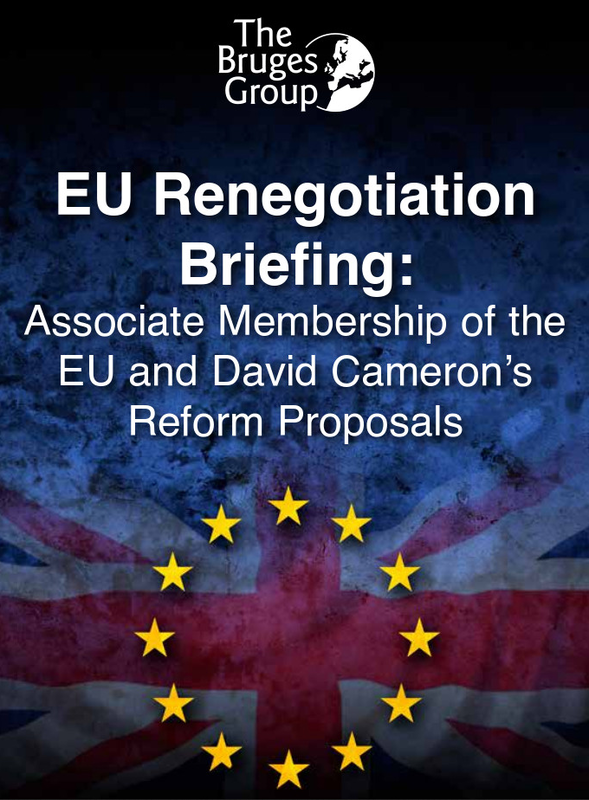 Indeed, the latest Vote Leave newsletter prompted pro-EU membership think tank (Open Europe) associate, Pawel Swidlicki, to comment: “Clever by @vote_leave to say Cameron will get all renegotiation demands, that way if he doesn’t (benefit restrictions tricky) looks very bad”. As ever with Vote Leave, this stance does have a certain superficial “cleverness” but Dominic Cummings is missing the schwerpunkt (missing the point). David Cameron has been entirely consistent in telling us that he is working towards a “new relationship” for Britain with the EU—and that is precisely what he is going to deliver. To defeat Mr Cameron, the “leave” campaign will need to propose a better alternative that is both credible and safe. To that end, the “negotiations” are an increasingly tedious piece of puppet theatre. The “new relationship” that the Prime Minister will offer to the British public, outlined nearly three years ago in the Bertelsmann/Spinelli, A Fundamental Law for the European Union, is third-class country status in a two-speed/two-tier European Union in which Britain is further excluded from the “table”—about which British politicians like to talk—as a consequence of the British public’s refusal to accept participation in the euro currency and the borderless Schengen zone. The absense of internal borders and a common currency are, of course, two hallmarks of a country. No “trade relationship” demands this level of uniformity from its member nations. The role of the Pinocchio Prime Minister therefore is to lie his way to a “remain” vote by dressing up what The Sceptic Isle correctly identifies as the “third-rate offer” of “associate membership” as something new and exciting. The precise form that the propaganda will take is not yet clear, but it does not demand a great deal of imagination to envisage a credible scenario. In other words, the Norway (Interim) Option offers almost precisely the “relationship” that Mr Cameron claims to favour, as the first part of a phased withdrawal that will necessarily involve flexible response and continuous development. The British Prime Minister has been touring European capitals to sell the idea of “associate membership” not only to Angela Merkel and Francois Hollande Nicolas Sarkozy but to the Prime Ministers of Norway and Iceland. First proposed to the two largest EFTA/EEA states during a visit to Iceland in October 2015, Mr Cameron’s radical proposal would see Britain leading a new EU grouping, comprised of countries that share the fundamental values of the EU core, but which do not wish to pursue “ever closer union” or participate in the euro project. No “leave” campaign that accepts the possibility of EU “reform” can convincingly oppose what will be seen as quite an appealing “compromise” and, crucially, safe option, once Mr Cameron and his PR people have packaged the “associate membership” offer for domestic consumption. This is part of the reason why the “leave” campaign must centre on the main point: Who governs Britain? All the while emphasising the fact that supranational subordination is fundamentally unacceptable for Britain—and always will be. We need a “new relationship” based on intergovernmental co-operation that recognises the right of the British people to have the definitive and deciding say in how and by whom we consent to be governed and which also enables Britain to play a positive and constructive role in shaping the processes of economic globalisation to suit our interests and those of other free trading nations around the world. The Cameron/Osborne plan is as clever as it is deceitful. By playing out the string on “reform” and “renegotiation”—probably for the best part of the next two years—the Tory Party practically guarantees that the legacy hacks, which are almost entirely reliant upon “prestige” sources for their information and opinion, will centre the legacy debate (almost exclusively) on what Cameron seeks from the “renegotiation”. Can he get this? What about that? He’s not even asked for the other! The Vote Leave group is particularly vulnerable to this “play” owing to the long history of Vote Leave Limited CEO, Matthew Elliott, inanely repeating the “reform” and “renegotiate” mantra that experienced “leave” campaigners have been hearing from Tory Party spokespersons for going on 30 of the last 40 years of Britain’s EU membership. Whether this is a case of the supine Elliott hoping for preferment within Tory Party HQ, while keeping his genuine desire for Britain to leave the EU private, or whether there is a more sinister motive for this equivocation is arguably less relevant than the fact that neither Elliott nor Lord Lawson, who leads Conservatives for Britain—both of whom accept that the British public must wait and see what “reforms” Cameron returns with from his “renegotiation” in Brussels—have any credibility when it comes to opposing Britain’s EU membership on the point of principle that subordination to a supranational entity is fundamentally unacceptable for Britain—and always will be. As those who have been paying attention are already aware, there are no negotiations. The “negotiations” are a shell game to occupy the legacy hacks. While these frivolities keep the children entertained, the mainstream debate is just beginning to make itself heard above the din of the “high-noise” leavers and the irrelevant “remains”. How and by whom Britain should be governed and the role that Britain should play in shaping the process of economic globalisation and the emerging global single market all need to be addressed. Does anybody accept David Cameron’s vision for Britain as a third-rate country in a two-tier treaty union in which the national institutions that “represent” us as citizens remain subordinate to the European Commission, the European Council, the Council of Ministers, the European Parliament and the European Court of Justice? Or do we wish for Britain to be an active participant in the global system with independent representation globally and democratic accountability running through our national government like a stick of rock? This is the debate that Cameron and Osborne do not want the British people to have; it is a debate in which the legacy hacks have no interest; and, whatever their intentions, it is a debate from which the Vote Leave and Leave.EU campaigns have absented themselves. As Alastair Campbell said on Question Time in May, just after the Tory’s unexpected election victory—not predicted by any of the legacy pundits who we are expected to take ever so seriously—“…even having the debate is dangerous”. Those words have been ringing in my ears ever since. “… even having the debate is dangerous…” He’s not wrong. Campbell, and his ilk—Osborne, Cameron, Clegg, Clarke, Mandelson—will do everything in their power to prevent the British people having a debate about leaving the European Union. The only option on the table in the debate that they would like to frame is “reform”—Vote Leave, Get Reform; Vote Remain, Get Reform—but the so-called “reform” that Cameron proposes is merely a form of words. Osborne, the supposed strategist who is leading the “negotiation” theatre, would just as soon the British people have a “national debate” about flower-arranging, if he thought that it would serve his purpose, but, no, that would be a little too obvious, so “reform” it is. By contrast, having set our mind on the “leave” outcome, let us seek to explain why leaving the EU is not only better for Britain, but the opportunity of a lifetime for all of us. The political parties do not hold all of the cards. We the people have considerable power of our own and we will have the opportunity to exercise it at the ballot box. First though we must break out of the (partially self-imposed) prison that accepts the outcome of this referendum is somehow fixed either way. The Norway (Interim) Option can assure a secure transition from EU Member State to independent nation-state which protects jobs and investment. The next question is: What happens afterwards? The Flexcit plan outlines an ambitious policy that would see Britain co-operating with the remaining EU Member States and other European nations to create a genuine free trade area in Europe, as a stepping stone to global free trade with partner countries around the world. This is the kind of proposal that only an independent Britain, with all of the ingenuity, innovation, intelligence and skill of the British people at its disposal, could play an active role in shaping. The legacy pundits have nothing to say about any of this, so, unless or until they decide to join us, we will have to let them get on with whatever it is that they do nowadays. If you wish to participate in the mainstream debate, there is serious work to be done.